Proper lighting is one of several critical parameters in successful reef keeping. If there is not enough light, photosynthetic creatures will slowly perish. On the other hand, many corals (or, more correctly, their symbiotic algae called zooxanthellae) can not tolerate conditions of ‘high’ light and might not thrive. Excessive light is potentially harmful to symbiotic invertebrates but is also wasteful and needlessly expensive. Many hobbyists and clubs have recognized this and have purchased light-measuring devices and many more are considering a purchase. This article will explain the differences between several of the commonly available ‘light’ meters and will also examine the pros and cons of each. ‘Lux’ is an internationally accepted measure of light intensity. Lux meters do not ‘see’ blue and red light very well, and it is these wavelengths that are most responsible for promoting photosynthesis. They are designed to report light intensity to which the human eye is most sensitive (green light). Maximum lux is about 120,000 (in the tropics at noon on a cloudless day (many lux meters will report lux up to 50,000, making them adequate for many reef aquaria, but unsuitable for brightly lighted tanks and outdoor work). Many use lux meters for measuring light and although these are better than not taking measurements at all, the preferred method is using a quantum meter (although see ‘Converting Lux to PAR’ section later in this article). Lux meters are generally less expensive than PAR meters. 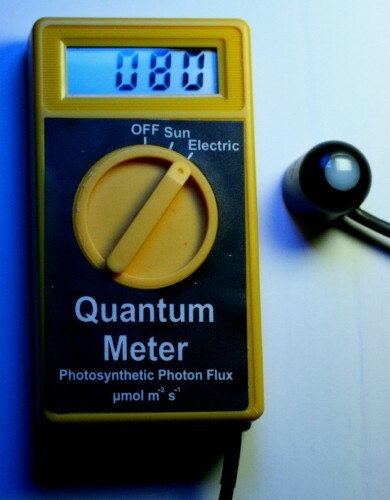 Quantum meters or PAR meters (PAR is an acronym for Photosynthetically Active Radiation) are rather specialized light meters. PAR meters are the preferred method of measuring light within any aquarium containing things that photosynthesize whether they are corals, anemones, freshwater plants, etc. This is because the PAR meter can sense and report light (‘photons’ or ‘quanta’) that is responsible for promoting photosynthesis. Technically, this is described as those light wavelengths that are between 400 nanometers (nm) and 700nm. PAR, or Photosynthetic Photon Flux Density (PPFD) is reported in units of ‘micro-Einsteins per square meter per second’ (µE·m²·sec) or ‘micro-Mol per square meter per second (µMol·m²·sec). Either term is acceptable, and they are equivalent to each other (i.e., 1 µE·m²·sec = µMol·m²·sec); however, µMol·m²·sec seems to have gained wider acceptance over the last few years. Maximum PAR value (in the tropics at noon on a cloudless day) is 2,000 – 2,200 µMol·m²·sec). There are a couple of quantum meters I can recommend. 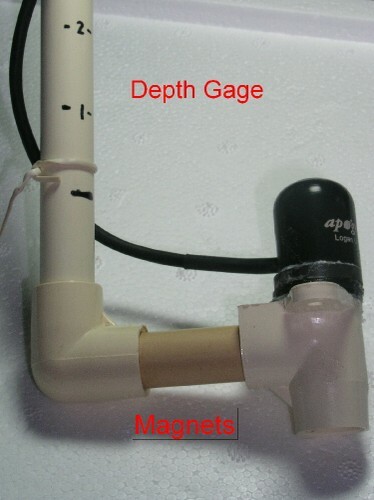 A ‘laboratory grade’ quantum meter (model LI-250A equipped with an underwater cosine-corrected sensor – LI-192) is built by Li-Cor (Lincoln, Nebraska). The meter (weather-proof but not submersible) and underwater sensor are rugged and will stand up to harsh conditions in the field. The meter can be calibrated for ‘air’ or ‘water’ readings (due to an optical property called the ‘immersion effect’). There are some drawbacks – the meter and sensor combination is relatively expensive (>$1,100). The sensor itself (the body is made of brass) is large and does not lend itself to work in smaller aquaria. Li-Cor also offers a second sensor option for underwater light measurements – the spherical LI-193. Its appearance is similar to that of a light bulb, and this sensor can collect light from all angles. This sensor would be the best choice for those wanting to measure light intensity in micro-algae cultures. Li-Cor also offers a datalogger capable of storing months of information (model LI-1400), but it is difficult to imagine the usefulness of this instrument to the majority of hobbyists. Note that all Li-Cor meters are capable of measuring very high PAR intensity – 20,000 µMol·m²·sec (almost a magnitude greater than the most intense sunlight!). Perhaps the best alternative is the quantum meter made by Apogee Instruments (Logan, Utah). The sensor is submersible (the meter itself is not!) and comes with a standard cable measuring about 6 feet in length. Custom cord lengths are available at additional cost. The Apogee’s price is well below that of the Li-Cor meter, making it attractive to advanced hobbyists (clubs may want to consider its purchase, thus making it available to many). The Apogee meter’s construction is not as stout as that of the Li-Cor, but its cosine-corrected sensor is small and made of relatively inert anodized aluminum and plastic. The Apogee meter is limited in its measurement range – it reports PAR intensity up to 1,999 µMol·m²·sec, and the sensor’s spectral response is not as good as that of the Li-Cor sensor. However, its measurements compare favorably with that of the Li-Cor meter and are accurate enough for the sort of measurements we’ll make in aquaria. In short, the Apogee meter will likely be the meter of choice for most. All Apogee meter/sensor combinations retail for less than $300. A quality sensor will be ‘cosine-corrected’, meaning that it can effectively collect light from low angles with good efficiency. However, this does not mean that the sensor should be held in a position other than straight up. A sensor held in the vertical position will help ensure that accurate measurements are made. Making a holder for your PAR sensor has several advantages. As most hobbyists know, it is best to avoid putting your hands in the aquarium – some corals don’t like it, and some corals don’t like you! It allows putting the sensor into spots too small for a hand and also allows better visuals on sensor positioning. Although a bolt can be used to attach the sensor to a ‘leveling plate’, it is less expensive and more convenient to use magnets as a holdfast to the measuring rod. Use your choice of glue to attach a magnet to the 90º fitting. Also glue a magnet to the bottom of the sensor. Bear in mind that couplings are available to allow unusually long measuring rods to be ‘broken down’ for easy transport. Temperature will usually have an insignificant effect on PAR readings. Sensors are generally calibrated at a given temperature (20 ºC, or 68 ºF) and temperature below this point will cause a very small (~0.1% per ºC) ‘low’ reading. In the same vein, ‘warm’ temperatures will cause ‘high’ readings. Operating temperature of the meter/sensor combination is limited by the sensor’s temperature tolerance (usually up to 55ºC, or 131ºF). Use only a mild detergent and water along with an ‘optical’ quality paper for cleaning. Vinegar can be used to dissolve ‘hard water’ deposits. Blot the sensor dry in order to avoid ‘fogging’ or scratching the lens. Avoid petroleum or other ‘strong’ solvents and abrasive cleaners – these can damage the sensor’s lens and ruin it! Although we generally think of corals as originating from brightly lighted natural reefs and naturally assume corals need lots of light, the truth is that most corals require relatively little in order to thrive. For example, the ‘Fox’ coral (Nemezophyllia sp.) does quite well in low light. Thriving specimens have been noted in as little light as 35 µMol·m²·sec! On the other hand, an Acropora specimen (commonly called the ‘Purple Monster’) displayed magnificent coloration in the highest light intensity I have ever measured in an aquarium – almost 900 µMol·m²·sec (later research reveal that this coral photo-saturates at 300-400 µMol·m²·sec. I was wasting a lot of light and money!). Most corals will grow quite well in light intensities of 200-300 µMol·m²·sec. Have questions? Have PAR/lux data you’d like to share? Contact me at RiddleLabs@aol.com, and I’ll get a response to you as soon as possible. Hobbyists using a light-measuring device for the first time will probably be surprised at how rapidly the light field can change within an aquarium (especially when using a point-source lamp such as metal halides. Stay cool – this is normal!). And it will become apparent that aquaria are not so bright (when compared to ‘outdoor’ measurements), and our rooms are actually very dimly lighted! The Marine Aquarium Conference of North America will be hosted by the Atlanta Reef Club in September 2008. You’re missing out if you don’t attend! See www.masna.org for details.